What’s the best way to beat those winter blues? Shake things up a bit, that’s how. Whether you are planning a weekend getaway with your partner or the family, want to celebrate Christmas somewhere new or hope to make 2015’s New Year’s celebrations the most exciting yet we thoroughly encourage you to choose a vacation in France as the answer. When most people think of winter holidays to France their mind immediately springs to the slopes of the Alps or perhaps Pyrenees. Worthy holidays though they may be you can get more out of France if you don’t isolate yourself to the mountains. The city streets are where things really come alive. 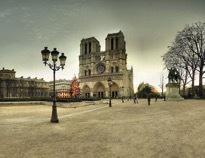 You may run the slight risk of having the weather work against you but bear in mind Paris is one of the cultural capitals of the world there’s much to see indoors. Since tourists are less likely to be holidaying during the festive season queues at the major locations – the Eiffel Tower, the Louvre and Notre Dame Cathedral will be shortened considerably. With Christmas on the horizon you won’t want to miss the seasonal markets that are popping up all over France. If you are just making a short trip to France before 2016 then the closest markets to Calais where P&O Ferries will be dropping you off and picking you are listed here. As you may expect there is a huge Christmas market in Paris and the celebrations in Lille are also considered to be some of the grandest in France. You might also want to consider hopping the border to Belgium to take advantage of some the great markets in Brussels, Lieges or Bruges. Alternatively you could catch a P&O Ferry from Hull to Zeebrugge – it’s an overnight voyage but you’ll land straight in Belgium which will place you perfectly for day trips to both France and Holland. If you wish to tour the northern coast of France the City of Caen is host to a sizeable Christmas market with upwards of 50 stalls, it opens late December running straight through to the new year. So you could make it a part of your New Year’s celebration and make a triumphant return to the UK for 2016. Caen is just a short way away from Mont St Michel, an historic strategic location that’ has been fortified, it has a long religious history and is listed as an UNESCO world heritage site. It’s well worth a visit and though there isn’t a Christmas market there’s plenty of shopping to be down there. It is decorated for the Christmas season though you’ll find that Mont St Michel is illuminated at night all year round. The capital of Normandy, Rouen is also a holiday favourite for this time of year. Rouen is famous for being the site of Joan of Arc’s death in 1431 – they begin Christmas celebrations at the start of December with Christmas markets (Marche de Noel) opening in the shadow of the grand Cathedral Notre Dame of Rouen. It’s a perfect place to visit whether you wish to embrace the spiritual side of the holiday, want to do some Christmas shopping or hope to keep the kids entertained with the skating rinks. The major christmas market to visit in north France is in Lille – there are around 3900 in this city, if you can’t find the perfect gift here then you simply aren’t trying hard enough. This city lights up in December with an 18m ferris wheel, ice-rink and dozens of specially erected Christmas chalets built up in the city centre. Each of these chalets is meticulously designed and laid out by the provender, the overall effect of this market will bring a smile to every face. The sights and smells of Christmas along with the copious amounts of carolling and festive feasting make Lille a true centre of the Christmas spirit. If, however, your intention is to get to the beating heart of the season and sup deep of the good cheer that vibrates across us all then the place for you to be this Christmas is Strasbourg. The city is close on the border to Germany, and therefore has a fantastic cultural mesh, Christmas unites and at Strasbourg you’ll find it seamless. 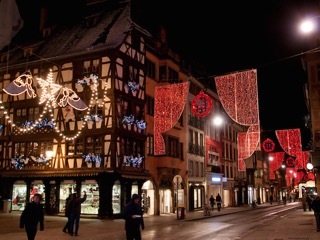 This year the markets in Strasbourg open on November 27th and are open through to New Year’s Eve. It has the honour of being the traditional city of Christmas markets since it was the site of the very first seasonal event way back in 1570. It was then known as Christkindelsmärik or ‘Market of the infant Jesus’ and it has been growing ever since. As well as the traditional tree you’ll find it hard to miss the extensive light displays, ferris wheel three hundred square meter ice-rink. Entry is free for children and the market opens from 10AM to 8PM every day. This is one of the largest Christmas events in Europe with an anticipated footfall of 2 million people all in all, there are 300 chalets established for the sale of goods and they’re all in fierce competition with each other to be the most festival stalls at the market. Weather this winter in France with P&O Ferries, the Dover to Calais service will get you their to celebrate Christmas on the continent!